Global Connexion, Inc. Original "AJC (All Japan Communications) All Japan Prepaid SIM Card" is a SIM card which enables data communication within Japan. 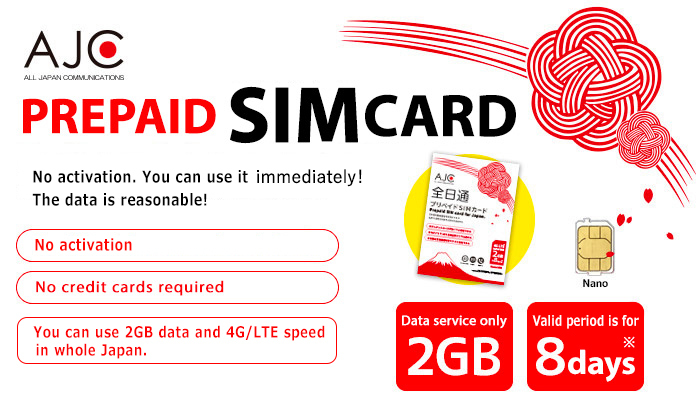 Contracting, cancellation and returning of used SIM card are not necessary. It is popular among overseas tourists as well as travellers within Japan. You can access to high speed 4G / Lte line everywhere within Japan. We provide various plans for low cost data communicating services.